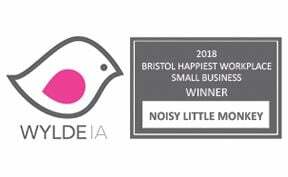 Noisy Little Monkey Limited, registered in England & Wales with number 06811136, whose registered office is at: Bishopbrook House, Cathedral Avenue, Wells, Somerset, BA5 1FD and whose head office is Loft 5, Tobacco Factory, Raleigh Road, Bristol, BS3 1TF (the “Company”). These Conditions shall be read together with any Specific Terms agreed by the Company, and relate to the provision of Services (Specific Terms and Services being as defined below) and any additional or related services provided from time to time by the Company to the Client. In accepting the provision of the Services, the Client shall be deemed to have accepted these Conditions, whether or not they have signed a Contract with the Company. “Contract” means any legally binding agreement for the provision of Services made between the parties which shall be subject to, and shall be deemed to incorporate, these Conditions. “Hourly Rates” means the applicable rate in £ sterling to be charged to the Client per hour for the work carried out, where the Price is to be calculated based on the number of hours spent, which may be updated by the Company from time to time. “Intellectual Property Rights” means all rights in the nature of intellectual property including, without limitation, all copyright, database rights and design rights in content, media, reports or otherwise. “Price” means the fees charged by the Company for the provision of the Services. a. On-page and off-page optimisation, including changes to the content of your Website, its architecture, devising and carrying out link-building and promoting your Website through social media platforms. b. Researching and reporting to you on your online market, including traffic and common search terms relating to your goods and services, with a view carrying out SEO. c. Developing a pay per click campaign, including researching and reporting to you on relevant search terms being used by your potential customers, together with advert creation and advice. d. Website design and build, including the creation of content and copywriting. e. Training in relation to the Services that we offer, allowing Clients to derive the most from them for their business. “Specific Terms” means any specific terms agreed in writing between the Company and the Client, which together with these Conditions, shall be the terms of the Contract. “Term” means the period of time (if any) set out in the Specific Terms or as otherwise agreed by the Company, from time to time. “Website” means the website content hosted at a particular URL, in respect of which Services are to be provided by the Company. 3.1. The Company will provide Services to the Client, to the extent that it has agreed to provide them; in the absence of any written or confirmed agreement between the Company and any Client, but where the Company is willing to provide Services, these Conditions shall be deemed to apply to that arrangement, whether or not the Client seeks or attempts to impose its own terms. A request for Services shall only be binding on the Company if accepted by it, either in writing, or by its conduct in commencing work. 3.2. Provision of Services will be by the Company and the Client accepts and acknowledges that its relationship under these Conditions is with the Company and not with any particular representative of the Company, who shall be acting on the Company’s behalf. 3.3. Any date(s) indicated by the Company for the completion of the provision of all or part of the Services shall not be of the essence, being an indication of expectation only and any failure by the Company to meet any such expected date(s) shall not entitle the Client to treat the Contract as repudiated or otherwise confer any right to rescind it or any related contract or arrangement with the Company. 3.4. The Client’s particular attention is drawn to the following Conditions: condition 12 (consequences of late or non-payment) and condition 18 (limit of liability). 3.5. The Client warrants that it has not been induced to enter in to a Contract as a result of any representation, statement or assurance made on or before the date of the Contract with the Company and no such representation, statement or assurance shall be deemed to be incorporated in to a Contract; the Client accepts that any indication of the Services contained in the Company’s advertising or marketing materials are only issued for the sole purpose of giving an approximate indication of the Services described in them and shall not have contractual force. 4.1. The provision of the Services shall be limited to the particular services and the scope of those Services as confirmed to the Client by the Company in writing; to the extent that such confirmation is not consistent with the service-requirements of the Client, the Client shall (as soon as possible, and in any event within 7 (seven) days) provide written notification of any mis-understandings, allowing the parties to accurately confirm the basis of the Services to be provided. 4.2. The provision of Services over and above those described in condition 4.1 shall be subject to separate charges relating to such further Services, the Client acknowledging that its requirements may increase over time, resulting in a request for the Company to carry out additional work at extra cost. 5.1. On an ongoing basis, the Client shall co-operate with the Company in all matters relating to the Services, including providing the Company with all necessary information and other items that it reasonably requires in order to carry out the Services. 5.2. The Client shall ensure that the Company is made fully aware of the nature and extent of the Services that it requires to be performed, to avoid any misunderstandings or discrepancies. 5.3. Where applicable, the Client shall notify the Company of any intended changes that it wishes to make to any aspect or element of the Website, prior to it doing so; the Client acknowledges that any un-notified changes may have an adverse effect on the results achievable by the Company’s provision of the Services. 5.4 Although the Company will use reasonable care and skill to assist the Client in complying with its legal obligations, including under data protection laws, the Company accepts no responsibility for ensuring the compliance with the Website or any campaign and the Client must obtain its own legal advice in this regard. 6.1. The Client warrants that all content and data held in respect of its Website is its exclusive property, is not licensed to it and does not infringe the intellectual property rights of any other person, firm or company. 6.2. The Client warrants, at the date of the Contract and thereafter, that it does not employ the services of any other person, firm or company to provide search engine optimisation, digital marketing, link-building or similar services in respect of the Website. 6.3. The Client warrants that it has not, and will not, whether directly or indirectly, engage(d) in link-building techniques that may adversely affect the success of the Company’s provision of Services, including, by way of example only, requesting or exchanging links with link farms, undertaking practices that might reasonably be considered spam, use of automated link submission or similar processes and/or attempting to artificially improve search-engine optimisation or otherwise engaging in any ‘Black Hat’ or similar techniques. 7.1. The Client accepts and acknowledges that attempting to improve the effectiveness of the Website through the provision of the Services is not an exact science and therefore the Client does not rely on any absolute belief that a particular result is guaranteed to be achieved or that such results are probable within a particular timeframe. 7.2. Although the Company will use reasonable care and skill to keep up to date with current trends and techniques in connection with the provision of Services, the Client accepts the Company has no control over the policies of any particular , social media platform, directory or similar, or the basis upon which such entities may or may not accept or rank a website, website content or particular pages belonging to or controlled by the Client, in a particular manner. 8.1. The Client grants or shall procure the grant of all necessary and reasonably requested access to all administrative and/or back-end systems, including without limitation the Client’s hosting accounts, domain registrations, analytics and data (however or wherever held), and shall provide all necessary passwords, access and login information to all such accounts, from time to time, enabling the Company to provide the Services. 8.2. The Company shall use all reasonable endeavours to maintain the security and confidentiality of all access and login information provided to it, in connection with the Services, but the Client accepts that the Company shall not be liable for any alterations or changes made to any content or data by any person outside of the Company’s control or without its express authority. 9.1. Subject to the right to cancel contained in Condition 10, the Contract shall not be for any particular length of time, unless specified in the Special Terms, in which case it shall come to an end at the expiry of the period stated. 9.2. Unless notice is validly given in accordance with Condition 10, in which case the Company will no longer be required to provide the Services, neither party may end this Contract early. 10.1. The Price shall either be a fixed fee or calculated based on the number of hours worked, multiplied by the applicable Hourly Rate, for each representative of the Company employed to provide the Services, unless stated otherwise by the Company and confirmed in writing to the Client. 10.2. Any Price quoted for the provision of Services shall only remain valid for a period of 30 days, or for such period of time specified in the relevant quotation. 10.3. Any estimate or quotation given to the Client for the provision of Services shall be subject to withdrawal or change up until those Services are commenced. Unless specified otherwise in any estimate or quotation, an estimate shall not be deemed to be a firm offer or fixed price but instead an indication of the likely costs associated with the provision of the Services by the Company. 10.4. All Prices are quoted excluding value added tax and the Client accepts that, where VAT is to apply, this shall be paid to the Company at the prevailing rate, in addition to the amount quoted. 11.1. The Company shall be entitled, at its option, to invoice the Client for the price of the Services on an interim basis (usually monthly); payment of such invoices becoming due 30 (thirty) days after their date of issue; time to be of the essence for this purpose. 11.2. All sums payable to the Company under these Conditions shall be paid in full without any deduction or set off, except for credit notes or where an amount has been agreed by the Company, in writing, as being due to the Client. 12.1. Failure by the Client to pay invoices promptly when due shall be a breach of these Conditions by the Client. 12.2. If the Client fails to make full payment when due, the Company may charge default interest in accordance with condition 12.3(a) and/or may terminate the Contract, in accordance with conditions 12.3(b) or 13.2.
b) to cancel the Contract or suspend all or any future provision of the Services to the Client (under the Contract or any other) until payment has been made in full. 12.4. Without prejudice to any other remedies available to it, the Company shall have a general and paramount lien over all property and assets of the Client which remain in its possession and shall be entitled to dispose of the same and to apply any proceeds received in satisfaction or part satisfaction of any sums due to it under a Contract, provided it has first given notice to the Client of its intention to do so. 13.1. Subject to condition 13.3, the Client may cancel the Contract by giving notice to that effect to the Company in writing, which shall be deemed to take effect on the date of actual receipt of the notice by the Company. 13.2. The Company may cancel the Contract on immediate notice where the Company reasonably considers the Client to be in material breach of its obligations under the Contract or where the Company is unable to perform its own obligations by reason of such failure. 13.3. The Company may terminate the Contract without notice if it reasonably suspects that any of the practices outlined in condition 6.3 are or have been carried out in respect of the Website. b) a petition or notice is filed, or a resolution passed, for or in connection with the winding up or bankruptcy of the Client, or otherwise to commence any formal insolvency process under applicable laws. 13.5. If the Contract is cancelled by the Client under condition 13.1 or is otherwise terminated (for whatever reason), the Company shall be entitled to invoice the Client for the number of hours worked up to that point, or in the case of work agreed to be carried out for a fixed price, for a sum equivalent to the Company’s reasonable estimate of the percentage of the work that has been completed, but the Company shall not be obliged to deliver any such work to the Client, although it may do so at its discretion. The Client shall indemnify and hold the Company harmless from and against all losses, damages, costs, expenses and liabilities incurred or suffered by the Company as a result of or arising from any act or omission of the Client (including those of others acting on its behalf) which relates in any way to the provision of the Services, or which arises from any claim or legal proceedings brought or threatened against the Company by any third party for the misuse of any rights, intellectual property, data or other information supplied to the Company by or on behalf of the Client, in relation to the provision of the Services. The Company shall maintain in force a policy of insurance covering all usual risks insured against by businesses similar to the Company, without charge to the Client. Details of such insurance will be provided, upon written request. In order to give the best possible service to Clients, where the Company considers it appropriate to sub-contract the provision of the Services to another firm or entity, it may do so freely; however, the responsibility to provide the Services to the Client, as agreed, shall remain with and be the responsibility of the Company. 17.1. All Intellectual Property Rights in or arising from the provision of the Services shall, subject to any license granted under condition 17.2, vest entirely in the Company which, for the avoidance of doubt, shall include all preparatory and draft versions of any such work. 17.2. The Company grants to the Client a non-exclusive license to use any items delivered or transferred to the Client as part of the fulfilment of the Services under this Contract for the purpose(s) contemplated at the date of this Contract, subject to the Client having paid all outstanding invoices and sums due to the Company for the provision of the Services. 17.3. Any license granted under condition 17.2 shall be for the benefit of the Client only and shall not be capable of being assigned or sub-licensed to any other person or entity, which shall include permission for any other person or entity to use or benefit from any such item(s), except in each case where the Company’s prior written consent has first been obtained but which the Company may at its option withhold. 18.1. Without prejudice to any statutory or common law rights not otherwise excluded under these Conditions, the Company shall not be subject to any liability under any warranty or these Conditions if the total Price for the Services has not been paid. 18.2. All warranties, conditions or other terms implied by statute or common law are excluded to the fullest extent permitted by applicable law; for the avoidance of doubt this condition 18 shall not operate to exclude or restrict liability for breach of any obligation arising from the Supply of Goods and Services Act 1982 or, if deemed to apply, the Sale of Goods Act 1979, as against the Client where the Client is dealing as a “consumer” as such term is understood by section 12 of the Unfair Contract Terms Act 1977. 18.3. Except in respect of death or personal injury caused by the Company’s negligence or in the event of fraud, the Company’s maximum liability to the Client under any Contract shall not exceed a sum equivalent to the Price. 18.4. The Company shall not be liable to the Client by reason of any representation (unless fraudulent), or any implied warranty, condition or other term, or any duty at common law, or under the express terms of these Conditions, for any indirect, special or consequential loss or damage (whether for loss of profit or otherwise), costs, expenses or other claims for compensation whatsoever (whether caused by negligence of the Company, its employees or agents or otherwise) which arise out of or in connection with the provision of the Services. 18.5. The Company shall not be liable to the Client or be deemed to be in breach of these Conditions by reason of any delay in performing or any failure to perform, any of the Company’s obligations in relation to the provision of the Services, if the delay or failure was due to any cause beyond the Company’s reasonable control. 19.1. The provisions of the Contract represent the entire agreement and understanding of the parties in relation to its subject matter. 19.2. No variation may be made to the Contract, save that the Company may update or amend these Conditions from time to time, without notice. 19.3. If there is any discrepancy between these Conditions and any other terms purported to apply as between the Company and the Client these Conditions shall prevail; however, any Specific Terms shall prevail over these Conditions where it is clear they are intended to do so. 19.4. If any provision, or part of a provision, of these Conditions is found by any court, tribunal or administrative body of competent jurisdiction to be wholly or partially invalid or unenforceable, then to the extent that it is considered invalid or unenforceable, it shall be deemed not to form part of these Conditions, but the remainder of these Conditions shall remain in full force and be construed with such changes as are necessary to make them valid. 19.5. The Company may assign, transfer or otherwise deal with a Contract, or any of its terms, as it wishes and without the prior consent of the Client; the Company shall procure that the identity of any assignee is confirmed to the Client as soon as reasonably possible; any attempted assignment by the Client shall be void, unless the Company permits this in writing. 19.6. Apart from any assignee, a person who is not a party to a Contract has no rights under the Contracts (Rights of Third Parties) Act 1999 to enforce any of its terms but this shall not affect any right or remedy of a third party which exists or is available apart from that act. 19.7. The construction, validity and performance of the Contract shall be governed by the laws of England and the parties hereby submit to the exclusive jurisdiction of the English courts to settle any disputes under it. 20.2. Any notice to be given to either party under the Contract, shall be in writing and may be served by hand or by pre-paid first class post addressed to the last known address of the addressee. 20.3. Communications shall be deemed to have been received, where delivered by hand, on the date that the communication was left at the relevant address, and if posted, on the second day (excluding weekends, bank and public holidays) after the date that the envelope containing the communication was given to the postal authorities, provided that the communication was pre-paid and correctly addressed.